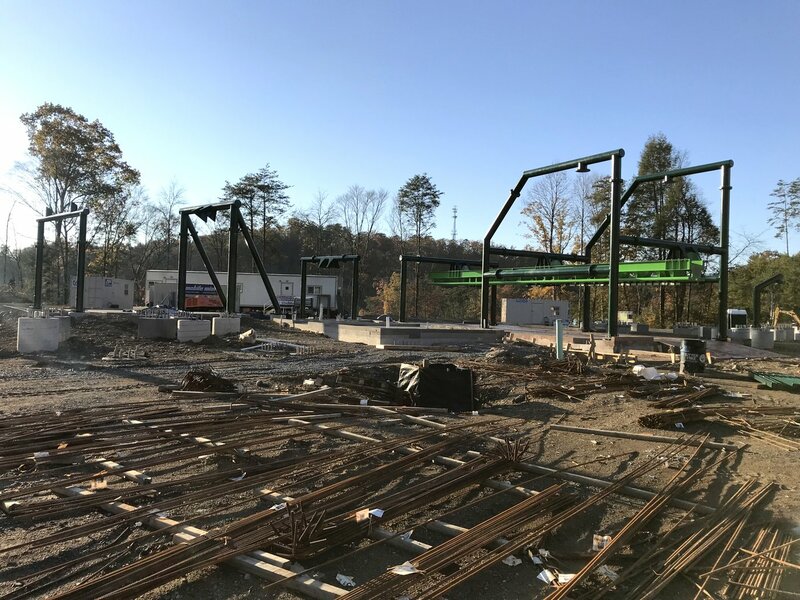 Attendees of the annual Smoky Mountain Coaster Fest (organized by the American Coaster Enthusiasts Southeast Region) were treated to the first-ever public tour of the Wildwood Grove construction site. 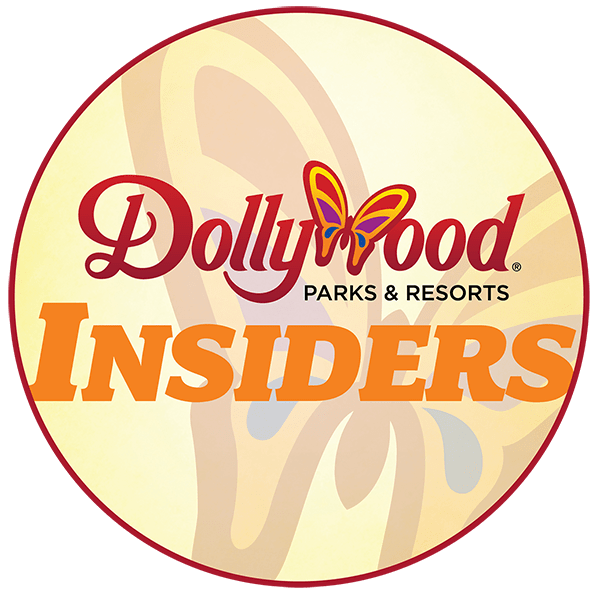 Dollywood’s Pete Owens, Vice President of Marketing and Public Relations, walked us through the area, pointing out the structures, foundations and infrastructure that dot the area. 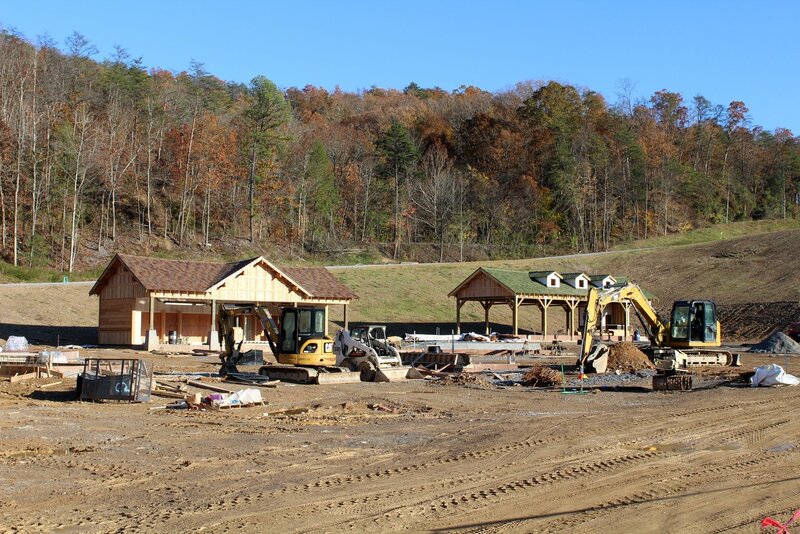 Wildwood Grove is Dollywood’s largest expansion to date and represents a $37 million investment. 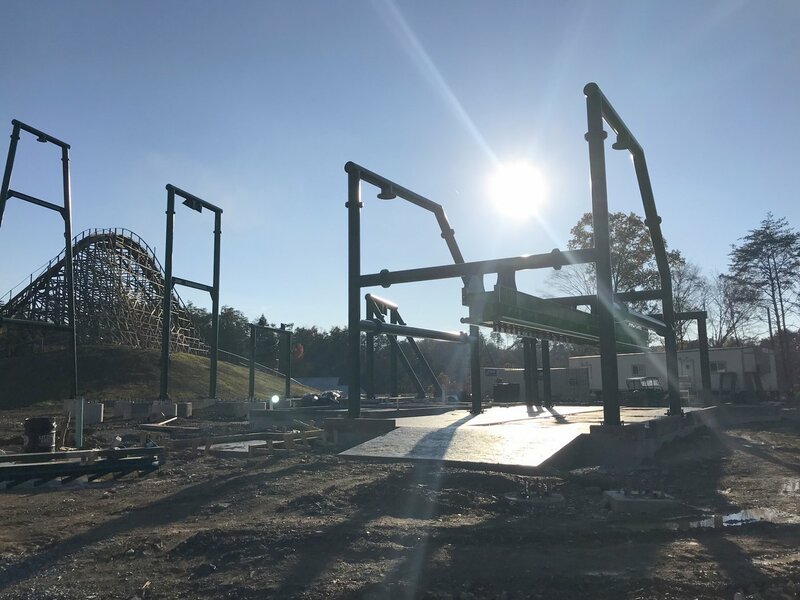 The area will feature 11 new rides and attractions for guests of all ages. Before we jump into the photos, above is an overview of Wildwood Grove — specifically the area we toured. We started in the top right quadrant, under what will become the Dragonflier suspended coaster’s second half. This photo (taken from the Dollywood Express train) gives a real-life overview of the site. 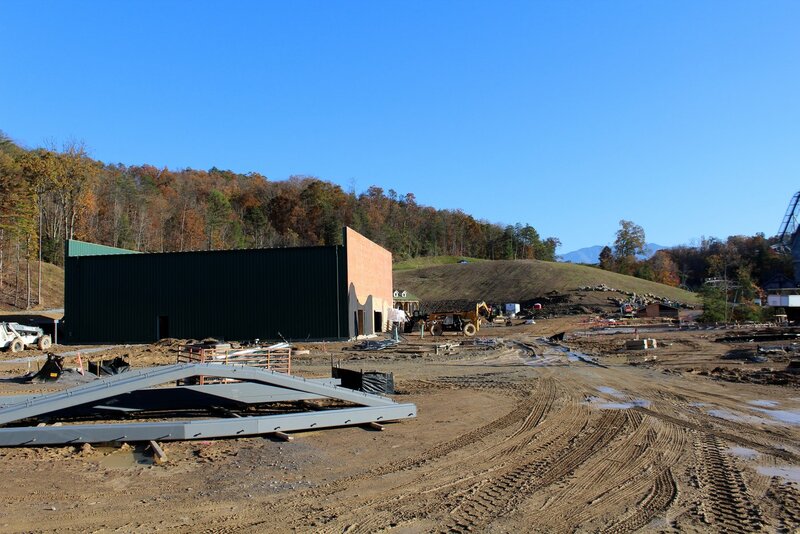 Our tour was concentrated primarily in the foreground, where the green Dragonflier supports have begun to rise. 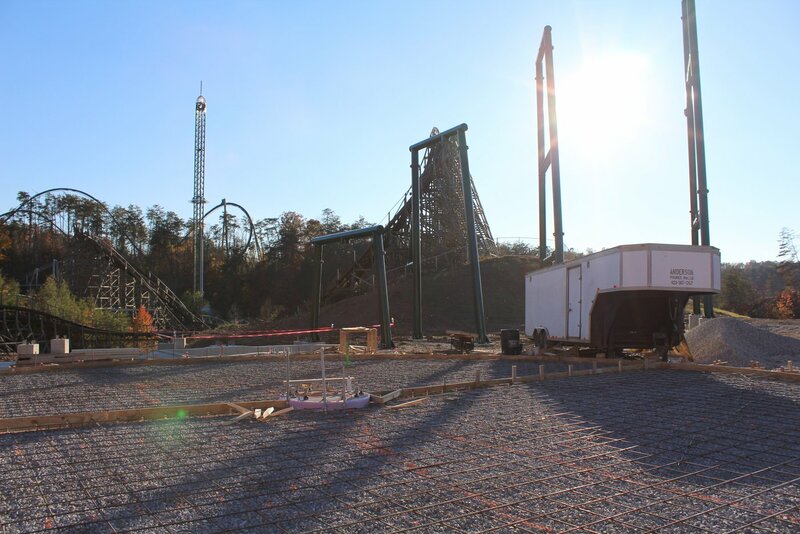 The supports appear to have reached Dragonflier’s peak height of around 63 feet. Much of the coaster’s station track has been installed. Pete confirmed that Dragonflier will have a tunnel, and I think this big hole in the ground confirms that! 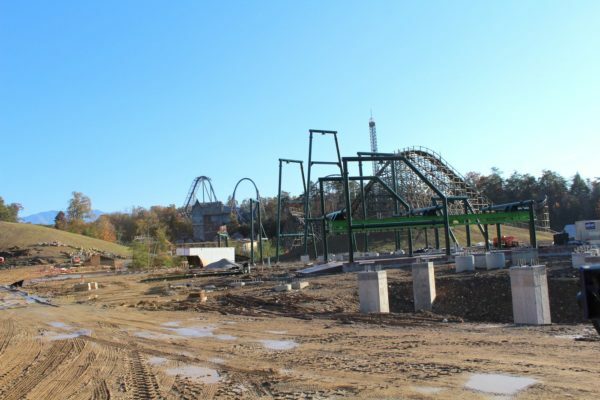 The coaster will also pass over a pond, triggering synchronized geysers that will spray water into the air. 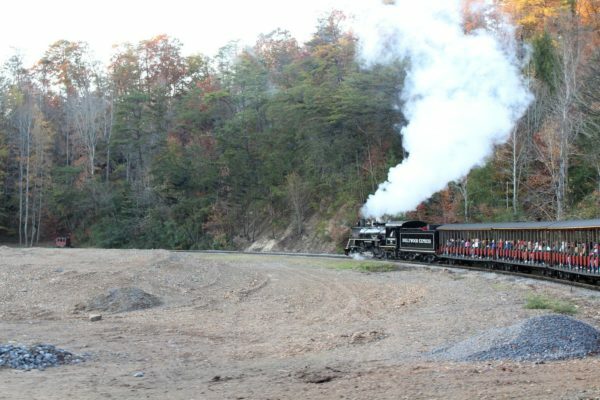 Dragonflier will only feature one 20-seat train. 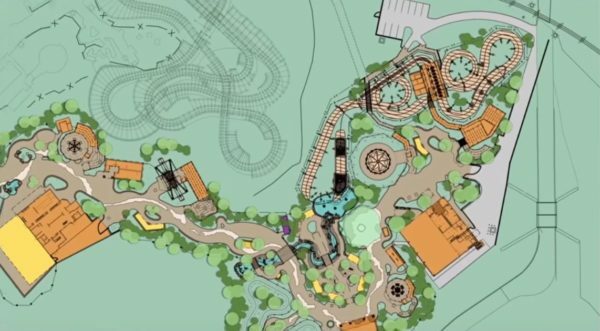 While that would be a concern for many parks, I’m sure Dollywood’s ride hosts will be able to dispatch trains quickly and efficiently. Given the popularity of Dollywood’s family-friendly FireChaser Express, I’m sure Dragonflier will also be in high demand. The staging area for the track sections parallels the Dollywood Express train route not far from the construction site. 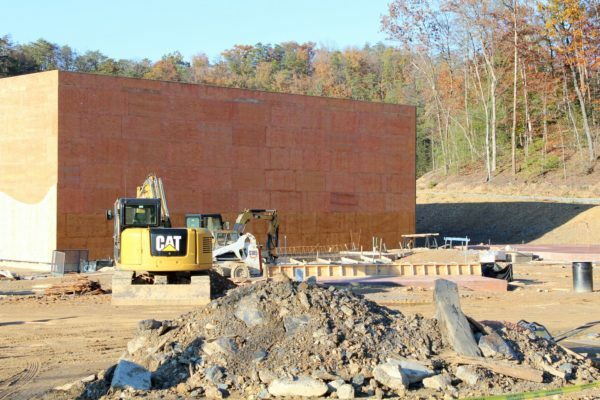 The indoor, climate-controlled Hidden Hollow play complex will be geared toward younger kids. 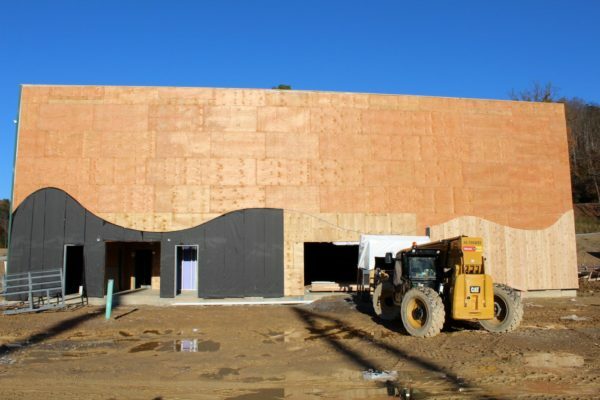 The outline of the building facade is coming into view. On the left is a structure that will house a retail location, while the building on the right is the station or queue for Black Bear Trail. 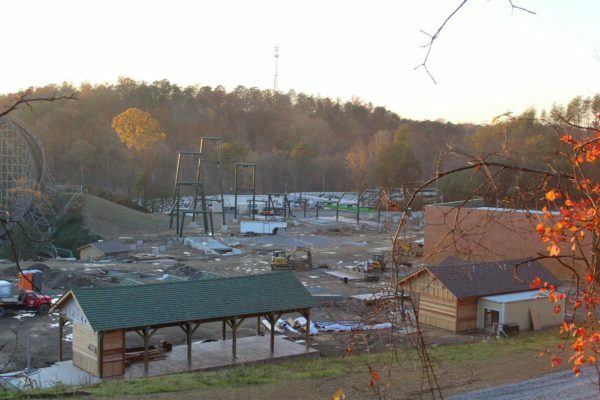 Wildwood Grove is unique for Dollywood in that most of the rides’ queue buildings will be behind the rides, allowing for better vantage points for non-riders. 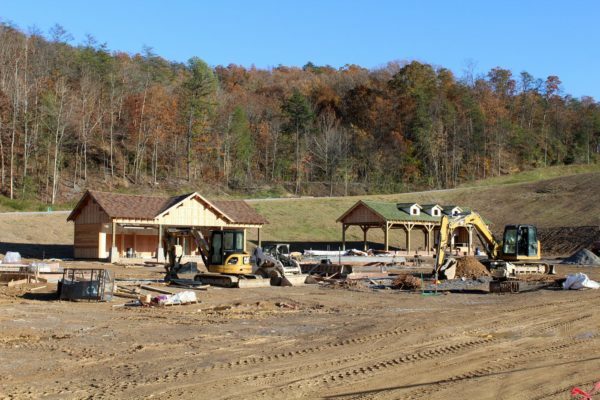 The buildings showcase the outdoorsy architecture and earthy colors that will be found throughout Wildwood Grove. I’m sure the apparel and souvenirs will match that aesthetic as well. 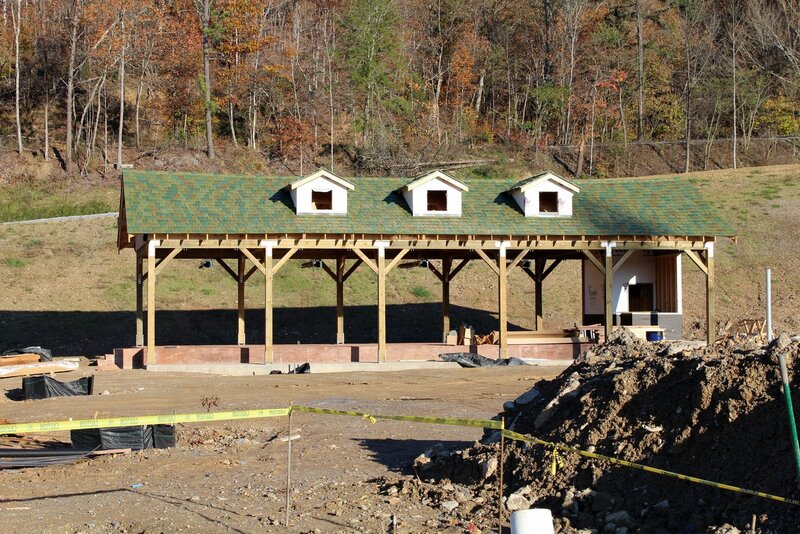 I’m sure that attention-to-detail will be prevalent throughout the area. The area may seem barren right now in terms of vegetation, but don’t forget that Dollywood is investing $1 million of the total $37 million in planting trees and other greenery across the new area. 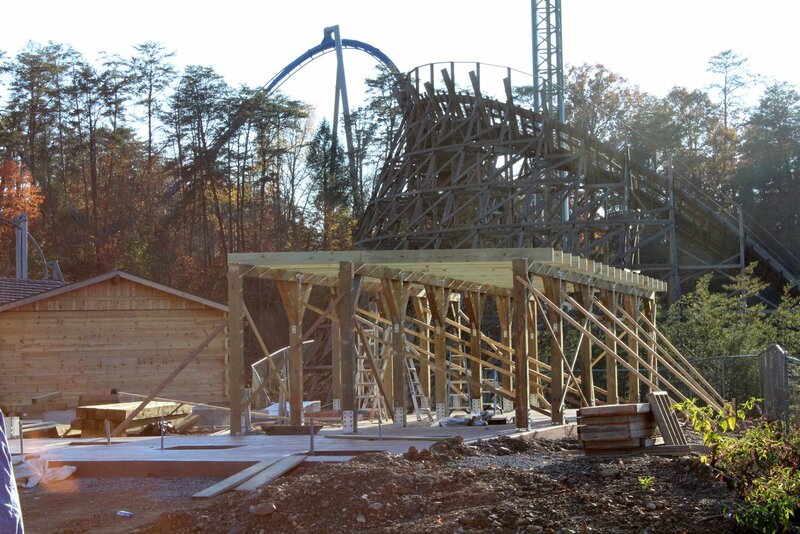 The base for the massive Wildwood Tree is just starting to emerge. 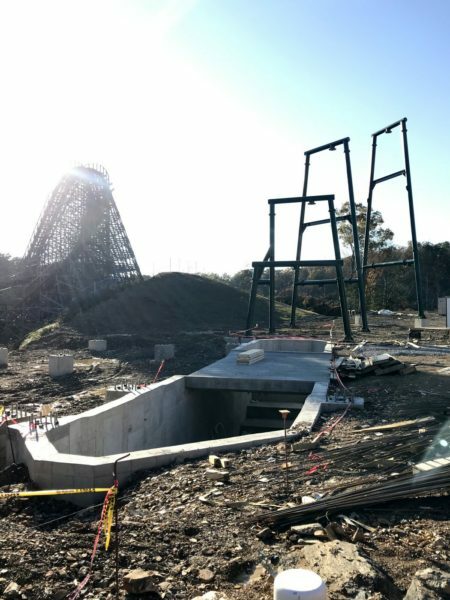 The tree is being assembled offsite in sections and will be delivered to the park for installation. While Dolly Parton herself was in the area for the Smoky Mountain Christmas kickoff, she visited a studio to record audio for the nighttime show centered around the tree. 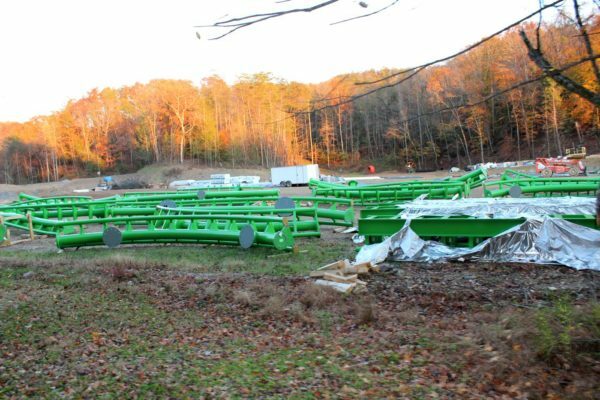 Wildwood Grove will give you never-before-scene views of some of the park’s coasters, namely Wild Eagle and Thunderhead. Pete also confirmed that Wildwood Grove is only taking up a portion of the land the park cleared. So I think it’s safe to expect another sizable expansion in the coming years. 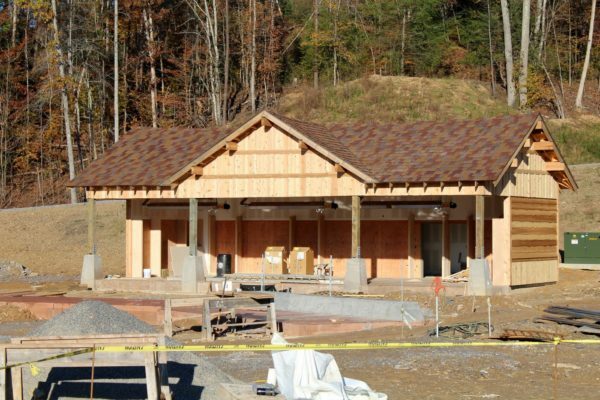 While no opening date has been announced, Wildwood Grove is expected to open in the spring of 2019. 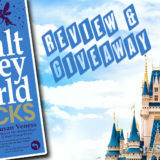 What do you think about Wildwood Grove so far? Share your thoughts in the comments section below. 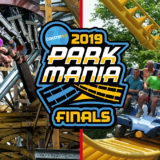 Nice but would love to see dolly make a RV Park at the park. 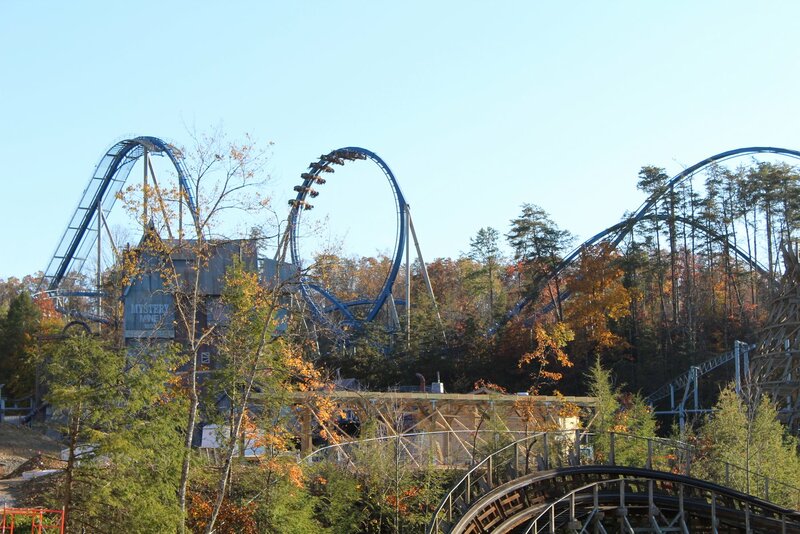 One neat thing about Thunderhead is it used to be surrounded by trees. Not any more.